Unaffected by a downgrade of the Saratoga turf courses from firm to yielding after a downpour, Robert and Peter Rosenthal’s homebred Frosty Bay (Frost Giant) picked up her second straight New York Stallion Stakes (NYSS) victory in Thursday’s $100,000 Statue of Liberty division for 3-year-old fillies with a lightning-fast closing move. Winner of the seven-furlong Cupecoy’s Joy division of the NYSS last out on June 30 over a firm course, and stretching out to one mile in the Statue of Liberty, Frosty Bay got somewhat lost in the betting in the 10-horse field, going to the post under Javier Castellano at generous odds of 7-1. After getting carried in shortly after the break, Frosty Bay settled nicely toward the back of the pack in eighth, as she traveled in the clear in the two-path behind a temperate pace set by John’s Mariah, who was tracked a length back by Palace Dreams (24.49, 49.08). Advancing in the clear though the far turn and four-wide at the top of the stretch, Frosty Bay launched a vigorous rally in the final furlong, passing new leader Palace Dreams, who had to settle for third, and a rallying Image of Noon, who finished second, and drawing away to get the victory by two lengths. The final time for the mile over the inner turf course was 1:37.29. After breaking her maiden routing in the slop on the Aqueduct inner in her fourth start last December 27, Frosty Bay has only failed to hit the board once in six subsequent starts. She is also three-four-four since adding blinkers, winning a turf route allowance by a head at Aqueduct in April and the Cupecoy’s Joy last out on June 30. 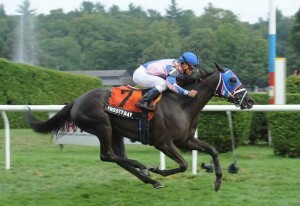 With two Stallion Stakes victories, Frosty Bay’s record now stands at 4-1-2 from 10 starts with $212,579 in earnings. 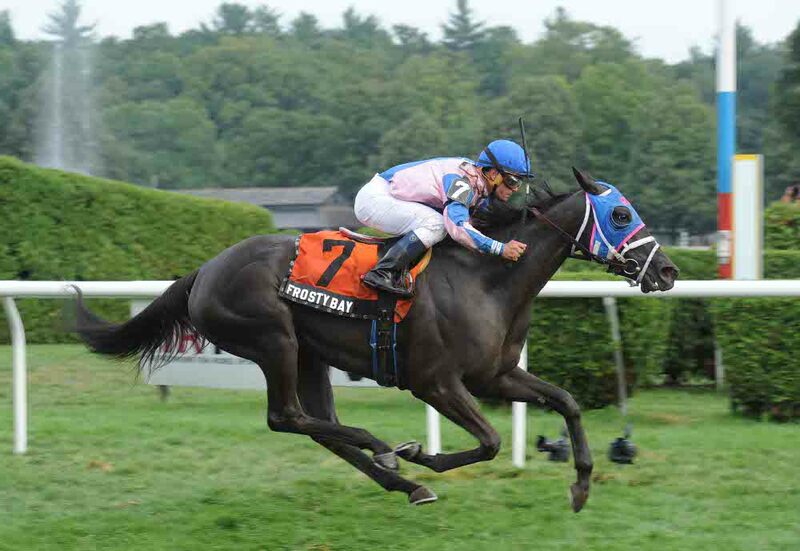 Foaled at Indigo Farm in Stanfordville, Frosty Bay is one of three winners from three starters out of Baymont, a five-time winner (four on turf) by Wild Again campaigned by the Rosenthals and trained by Schettino ($189,256). Baymont currently has a 2-year-old filly by Posse named Missy Bay, who has not yet started, and a weanling filly by Golden Missile. After West Hill’s Giant took the NYSS Cab Calloway division via a DQ at Saratoga on Wednesday, Frosty Bay’s victory in the Statue of liberty completes the second straight sweep of paired NYSS races by progeny of Frost Giant, after the same two horses won and Cupecoy’s Joy and Spectacular Bid divisions at Belmont on June 30. Frost Giant, who stands at Keane Stud, was the leading freshman sire in New York in 2012, setting new record for New York first crop progeny earnings ($840,633).